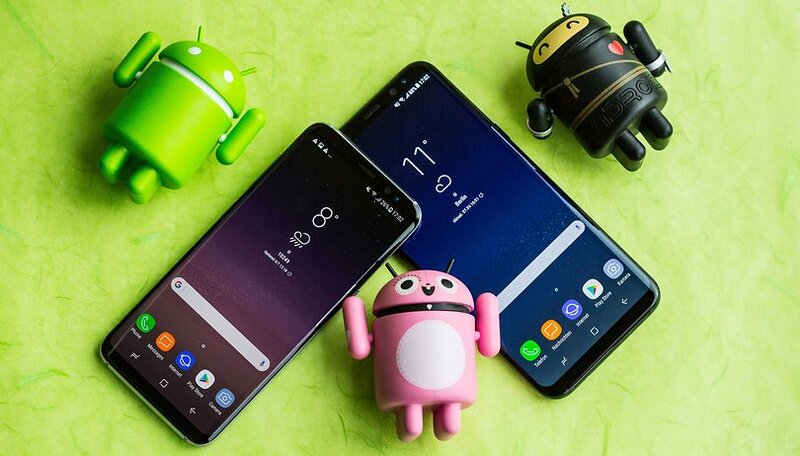 The Samsung Galaxy S8, and the larger S8+, are among the most popular smartphones of the moment. Accessories from Samsung, like the DeX docking station, and third party brands are already available for these new flagships. Here is our overview of the best cases, chargers, and other accessories for the Galaxy S8 and S8+. We've just added keyboard and LED cases, a car charger and the Samsung Connect Home Wi-Fi System. Samsung offers a variety of cases for its new flagships. Some are quite basic, while others are more advanced, and the S View case clearly falls in the latter category. To prop your phone up on the table, to watch a video for example, you can fold the case. This is common with tablets, which tend to have larger screens than smartphones. But, the S8+ has a substantial 6.2-inch display which makes it ideal for multimedia. You can find these cases at a great price on Amazon. Here, we have a different design. This Spigen case may not be the most elegant on the market, but it offers a lot of style and protection. A flexible polyurethane layer is combined with a hard polycarbonate to make it a shockproof system. For those who like something a little eccentric, there's an original option for you from Samsung. It doesn't cover the whole phone, but instead, just the top and bottom. It doesn't hinder either the function or design, as it only covers the corners. If you like a touch of color, it's a good choice, but it's not to everyone's taste. While Blackberry phones are all but a thing of the past, it's still possible to get a tactile keyboard experience without having to settle for the new KeyOne. The Samsung Keyboard Cover snaps onto the front of your S8 or S8+, giving you real keys to type on (and shortcut buttons). The best part? No charging required! Sitting somewhere between fashion and fuctionality is the LED View Cover from Samsung. LED lights on the front of the case display the time and have a range of icons to display other info, plus you can actually control the phone without opening the cover. To reject a call for instance, you simply swipe. It comes in fun colors like gold and pink, but also more subdued black and silver. On the inside, it even has a little pocket for cards. Moshi offers a screen protector, but only at a price far higher than the competition (over $40 on average). But, it's worth it, as it offers great protection from scratches and pesky fingerprints. Don't like to fuss with cables? Get a wireless charger, it simplifies things. All you have to do is set the phone down on the charger. There are alternatives to the Samsung solution, but we haven't had the opportunity to test them. Samsung's option is covered in stylish leather and is fast charge compatible. Having a dead phone in the middle of the day is a total bummer. Fortunately, portable power banks make it possible to restore a bit of juice and revive the exhausted device. Among the many options, we suggest the Tronsmart Presto, which has a 10,400 mAh capacity. It connects via USB Type-C, and all you have to do is plug it in to your S8 and S8+ when you're on the go. Is your GPS app hogging your phone's battery life? Then it's time to get a car charger. After all, it's cheaper than buying a brand new car with a wireless charging pad. This one from Belkin does the trick, and it comes with a USB Type-C cable. Samsung has introduced a new Gear 360 together with the Galaxy S8 / S8+. The Gear 360 (2017) has been redesigned, so the camera is nicer to hold. The record button moved slightly downwards, and the handling profits from this greatly. Because the lenses are now closer together, the stitching of the images into a 360-degree image is better. Among the highlights are 4K videos and the possibility of livestreaming - also in 360 degrees, of course. The connection to the charger is now via USB Type-C. The DeX docking station brings a Desktop Experience, by turning the Galaxy S8 / S8+ into a PC. Via HDMI, you can plug in a monitor, and two USB ports provide for connection to a mouse and keyboard. If you plug the S8 / S8+ into the docking station, in a few seconds, a classic desktop interface will appear on the monitor, and the apps will appear in windows. Multitasking is possible, largely through the multi-window feature of Android Nougat. Check out our review of the DeX docking station. For fans of virtual reality, Samsung has been offering it's Gear VR headset for a while now. The latest headset may be of interest to you. This version is also available with a controller, and can be found on Amazon. The Samsung Connect Home is a mesh Wi-Fi router, which can have its range extended by adding additional Connect Home boxes to cover your whole home. What makes it a great pair for the S8 is that it also acts as a SmartThings Hub, and from your S8, you can control all your compatible smart home devices. Will you be investing in any of these accessories? What do you think of a desktop mode for smartphones? It is such an interesting list. But the rugged case from Poetic surely deserves a place in this list. Good idea whith two piece Samsung cover!Like it! I can't remember when I've paid more than $15 for a case. or more than £10 for the screen protector. Now i have case friendly screen protector for less than £3 + case And it is great quality. Those cases are the ugliest things I've ever seen. Looks like a pretty interesting and immersive experience. The whole idea of having a single device to manage your mobile and stationary experiences is really something that looks like the future. It will consolidate the fragmentation that is occurring with people juggling mobile phones, phablets, tablets, laptops, and desktop stations. I guess everyone has PC, tablet or Chrome book at home or/and in office.... on which is possible to connect any phone and it's memory, use all that is on a phone. so i really don't see why would one have this thing and PC screen or TV, mouse and keyboard with self all the time. I mean, it is little hard to put all those things in backpack! ?